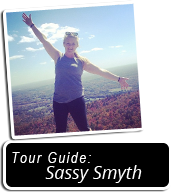 Sassy Smyth was born in 1984 and grew up in Statesville, North Carolina. Sassy grew up in a large extended family and has always enjoyed spending time with her family. She first encountered Teens' Camping Tour of the West in 2000 when she participated in the program as a teen. Sassy knew soon after her return after the trip that it would be a part of her life forever. The lessons she learned on her westward adventure and the friendships she made stayed with her throughout high school, college, and her adult life. One philosphy that the tour impresses upon its participants is that you have unique gifts and it's your responsbility to use those gifts to make your corner of the world a better place. Sassy felt she was able to do just that when she staffed for the first time in the summer of 2006, and she was hooked! She has continued staffing ever since and recently became the tour's third director after several years as the tour's associate director. Sassy is excited to carry on Peter Cole and Doug Gill's dreams of helping teenagers discover the joys and lessons of self discovery through travel, curiousity, and daily adventures. TCTW and Sassy are committed to helping make the world a better place by helping young adults realize their potential, discover their gifts, take their responsibilities seriously, and figure out how they can make their corner of the world just a little bit better.